I’M COMING TO WORK AWAY ON MY OWN, IS THIS COMMON? Over 90% of the workers last summer came out to Ayia Napa on their own. We understand it can be a little daunting at first, but all workers are in the same boat. You will have plenty of time to meet friends before travelling to Ayia Napa, on our workers forum. I AM COMING TO WORK IN AYIA NAPA WITH FRIENDS. IS IT POSSIBLE FOR US TO LIVE IN THE SAME APARTMENT OR WILL MY HOUSEMATES BE RANDOMLY SELECTED? We will always ensure you can share an apartment with friends. We always listen to our workers apartment preferences. Whether you choose to live in a house with your friends, full of boys or girls, it’s our promise that we will do our very best to ensure you get what you ask for. One month fully paid accommodation in a top workers block. Flights are not conducive to our set package price. http://skyscanner.net is an excellent website to book your flights from. One way flights to Ayia Napa can be found for as little as forty pounds including luggage if booked early on. We would not advise you booking a return flight at this stage. To book your flights online you will need your passport and debit/credit card to hand. After booking is complete you will receive an email asking you to check-in online and print your boarding pass. Wages vary from job to job. You can expect to earn from €25 up to €500 per day, if you are a good ticket seller. Our rep will meet you either at the airport or on arrival in resort. You will then receive your workers wristband and be checked-in to your workers room. After this you will be introduced to your roommates and shown around. Our rep will always be available to make sure you feel totally at home in Ayia Napa. We recommend you taking out private health insurance. Your EU health card will give you basic treatment and emergency treatment but private healthcare is still a better option. We will contact you nearer the time with the travel insurance company we recommend. DO I HAVE A GUARANTEED PLACE IN THE WORKERS ACCOMMODATION? The moment we receive the £60 deposit we will reserve your place in the workers accommodation for your first month. After that month expires, we can arrange your second months stay in resort. You will receive a welcome pack which will give you more details and we will begin the recruitment process. DO I HAVE TO WORK IF I CAME AWAY WITH WORKINAYIANAPA.COM? 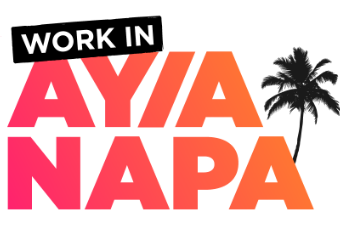 Our mission is to find work for everyone on arrival in Ayia Napa, as we believe this will give you a real taste of what a season in Ayia Napa is about. However if you are here for an extended holiday then you are more than welcome to still come out with us. We would advise that if you don’t have plans to work, then you should bring as much spending money as you can to maintain your 24/7 Party lifestyle. Click APPLY NOW to begin your booking. HOW DO I FIND JOBS THROUGH YOU? We are uniquely unlike other working companies because we help you find jobs even before you arrive in resort through our job forum. Here we have all of the Bar Managers, Club directors and Event Managers who will post a full list of exciting job opportunities for the summer which you can apply too. It’s not uncommon for lots of our staff to have jobs the second they land. Where we pride ourselves the most however, is our experience and unwavering ability in finding everybody sales positions and job trials. We have exclusive contracts throughout Ayia Napa with the majority of the bars, clubs and event companies. We will take the time to sit down and listen to what roles you are interested in and will help you grab that job role that you’re after. HOW DO JOB TRIALS WORK? Job trials are very common here in Ayia Napa. Many of the bars and club managers feel this is the best way to see if you’re the right person for the job. Here is your time to shine. Always enter every job trial with energy and enthusiasm. Be prepared to have your job trial spread out over a few days so the managers can make sure they are making the right decision in employing you as this can be difficult after only seeing you in the role for a few hours. Don’t feel disheartened if you don’t land the job on your first trial, you will gain skills and experience from each trial that you can take forward on to the next one. We are here for you every step of the way and won’t rest until we have found each and everyone of you a job for the summer season. After successfully landing a trial you will begin work immediately. Some venues will pay you on a weekly basis, some on a monthly basis and some will pay you after each working shift. WHAT TYPE OF PEOPLE GET JOBS IN AYIA NAPA? Contrary to popular belief you do not have to be the most outrageously confident person with the ability to drink your weight in alcohol every night. The most successful workers are those who are outgoing, hardworking, personable and who are responsible enough to turn up for work when their shift starts. Working in Ayia Napa is not just a six months party, your employer will expect a level of professionalism off you if you want to stay in work. There will always be plenty of time to party. WHATS THE BEST TIME TO GET JOBS IN AYIA NAPA? There is no selected date which is the best to get jobs in Ayia Napa. Everywhere in Ayia Napa starts recruiting from early April and it is usually a case of ‘first come first served.’ Lots of the positions will be snapped up in the early weeks so coming out early is certainly an advantage. The season progressively gets busier with tourists as the season moves into late May and June so more positions will open up and lots more staff are taken on. Many of our workers came out to work in late July and August last summer and we were able to find work for all of them, so don’t feel you will miss out if you are not able to join us at the beginning of the season. BENEFITS OF WORKING THROUGH YOUR COMPANY? We are Ayia Napa’s official longest running workers company. We are the only company that are able to offer actual jobs opposed to just job trials. We also provide apartments in the official Ayia Napa workers accommodation, where the majority of the workers stay. We are working closely with the owners and operators of almost all clubs, bars and events in Ayia Napa. CAN I SORT EVERYTHING MYSELF? We see many people come out and try this every year. A lot end up struggling to find any where to work or live due to lack of support and advice. With WorkinAyiaNapa.com we offer only the best accommodation and advice for when you arrive. WHEN IS THE LATEST I CAN PAY THE WHOLE AMOUNT? Final balance is due 6 weeks prior to your arrival in resort, but we recommend paying the full amount as early as possible in order to sort everything on time and plan your budget. Absolutely. You need a passport that is valid for the proposed duration of your placement and for a period of no less than 6 calendar months following your return. DO I HAVE TO COME OUT AS EARLY AS APRIL AS I HAVE OTHER COMMITMENTS? Not at all. We recruit workers for Ayia Napa from April all the way through to August. WHAT HAPPENS IF I CAN NOT PAY THE £60 DEPOSIT STRAIGHT AWAY? We understand that not everybody has the money straight away to become a member of our workers community. Just give us a shout as to when you can make the payment. In the meantime we will happily give you as much advice as you need for working in Ayia Napa so feel free to contact us with any questions you may have. CAN I PAY ALL OF MY FEE UPFRONT? Yes you can. Please email info@workinayianapa.com to arrange this. Once all of your fee is paid your accommodation and package will be arranged. Booking are made separately, but if you want to share an apartment as a group, please contact us via the contact page. DO I NEED A WORK PERMIT TO WORK IN AYIA NAPA? If you are an Eropean Union National, you will not have to concern yourself with work permits and such like. A lot of people come out with about 300-400 euros, but end up calling home for more. If you are sensible and are keen to work straight away, 450 euros should be enough to cover first weeks pay and a weeks living. If you plan on going out a lot in your first week, which most do, bring a bit more. IS MY UK DRIVING LICENSE VALID IN AYIA NAPA? Yes, it is valid. If you own a full driving license you will be able to drive a car, scooted, beach buggy or quad in Ayia Napa. MY PARENTS ARE CONCERNED ABOUT ME COMING AWAY ON MY OWN. We will happily speak to your parents to reassure them of any concerns they have. All of our parents had the same reservations when we decided to make the big jump into working abroad, so we have all been there. DO I HAVE TO STAY FOR THE ENTIRE SEASON? We love it when the workers stay for the entire season and see the summer out in Ayia Napa but we understand everybody has commitments back home or will need to begin University. You can stay in the workers accommodation as long as you want.